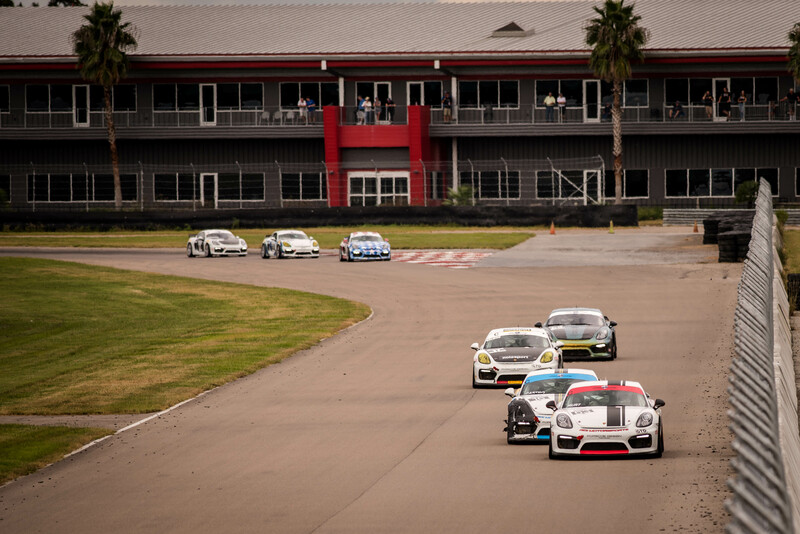 Seventeen PCA Club Racing Porsche Cayman GT4 Clubsport Trophy East series competitors took the green flag for Sprint 1 Saturday morning at NOLA Motorsports Park during the 2017 PCA Mardi Gras Cup, hosted by the Mardi Gras and Whiskey Bay PCA Regions. The muggy heat in the Big Easy didn’t slow down John Crosby, chair of the PCA Mardi Gras Cup event and Clubsport series competitor. NOLAsport’s Crosby calls NOLA Motorsports Park his home track and it showed during Sprint 1 after he won both the Championship and Masters classes, coming in third place overall behind two MR entries. Following an incident on the first lap in Turn 2, five cars were unable to continue the race. Drivers competed under double yellow for several laps before restarting. ACI Motorsports’ David Hurt had a career-best race and was able to pass two entries during the restart to gain his first podium of the 2017 season. Hurt came in second place in the Championship class behind Crosby. Polesitter Jim Cox, representing the Central Florida PCA Region in his No. 38 BGB Motorsports MR entry, is back in action with the series and gained first place overall and first in the Pro class. His BGB Motorsports teammate, Bruce McKee, who represents the Alabama PCA Region, came in second place in the Pro class. New to the Pro class, Midwest Eurosport’s Ben Ripstein upgraded his No. 05 Clubsport entry with the MR package and came in third. This marks Ripstein’s first podium, and he’s looking forward to additional improvement to come. In the Masters class, which is for drivers age 57 and older, Crosby won first with Masters class points leader Charlie Craig coming in second in his No. 76 Autometrics Motorsports entry and Kathy Mead coming in third. During Saturday afternoon’s Sprint 2, Crosby swept the sprints at his home track – taking home four first-place podiums in both the Championship and Masters classes. ACI Motorsports’ Efrin Castro started at the back of the pack due to the incident in Sprint 1, but slowly worked his way through the field to gain a second-place finish in the Championship class. “Honestly, I didn’t think I would make it to Sprint 2 [following the incident in Sprint 1], but having the ACI Motorsports crew with all of their experience – they got me back on track and I was able to race,” Castro said. Castro passed his teammate, Hurt, about 10 laps into the 30-minute sprint. Hurt was leading the Championship class for several laps at the beginning of the race, but the rookie driver couldn’t keep up the pace and ended up placing fourth in class and sixth overall. NOLAsport’s Galindo rounded out the Championship class podium in third place. Galindo passed multiple entries after also starting at the back. In the Pro class, Cox, McKee and Ripstein repeated their 1-2-3 finish from Sprint 1. Cox lead the entire race, with McKee following in second overall. In the Masters class, Crosby took home the first-place trophy once again with Craig came in second place and TOPP Racing’s David Walker coming in third for his first podium of the weekend. The 80-minute enduro at NOLA Motorsports Park marked what may have been the most exciting race of the 2017 season thus far – plenty of passing, precise pit stops and new driver changes made the race that much better for drivers and spectators alike. David Baum, representing the Western Michigan PCA Region in his No. 24 Autometrics Motorsports entry, fought hard for his first-place finish overall and in the Championship class. NOLAsport’s Galindo was on his tail for most of the race – especially when the rain started. This race was extra competitive as both Baum and Galindo are in a battle for second place in the Championship class points. This podium at NOLA Motorsports Park marks Baum’s second victory – his first was at Watkins Glen International in early June. ACI Motorsports’ Castro rounded out the Championship class podium in third place. Castro’s teammate, Curt Swearingin who is leading the points in the Championship class, shared a car in the enduro with BGB Motorsports’ Tom Collingwood. Swearingin had an incident before the weekend kicked off and was unable to race, but Collingwood and BGB Motorsports graciously offered Swearingin the chance to finish out the enduro and gain some extra points before the season finale next month. In the Masters class, Crosby swept the weekend with his third first-place Masters class win at his home track. TOPP Racing’s Richard McIntosh followed in second place – his first podium of the event after a rough start to the weekend. Craig placed third in the Masters class and gained his third podium of the weekend in his No. 76 Autometrics motor sports Cayman GT4 Clubsport. The series’ Pro class had a new winning team following the rainy race. BGB Motorsports’ McKee and John Tecce gained their first win of the season in McKee’s No. 87 entry. Tecce, BGB Motorsports’ pro driver, finished out the enduro for McKee and drove to victory. Midwest Eurosport’s Ripstein gained his third podium of the weekend with a career-best second-place finish. Noël Brown, who had just received his new Clubsport entry one day before the event weekend, followed in third place for the Pro class. Next up, the drivers will compete in the season finale at Daytona International Speedway Oct. 27-29 and celebrate the successful 2017 season with the Championship Awards Banquet Sunday, Oct. 29.